Druze for Israel Forum says Druze demonstrated with Israeli flags and Hatikva while Arabs demonstrated with PLO flags and chants. 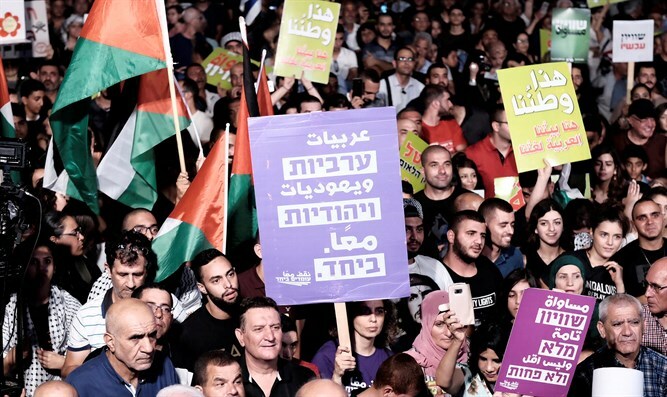 The chairman of the Druze for Israel Forum, Likud member Mendy Safdie, spoke to Arutz Sheva about the demonstration by leftists and Israeli Arabs in Rabin Square in Rabin Square where PLO flags were raised and the slogan 'We will redeem you Palestine' was shouted. "Yesterday's demonstration demonstrated the need for the Nationality Law. It is clear and unequivocal," Safdie said when asked if the demonstration last night harmed Druze who may find themselves tagged on the same side as the extreme demonstrators. He said that "last week's demonstration demonstrated the need to legislate a law to define the status of the Druze minority in the State of Israel. [The Druze and the Arabs] are two separate populations that do not belong to each other, apart from the common language and the fact that we lived in that area." "Yesterday's demonstration was damaging to the subject in general, because here people can mistake the two populations for the same purpose." However, Safdie believes that the PLO flags in the square sharpen the difference between the two populations and between the two demonstrations. In that it illustrated the differences. A week ago, people demonstrated to strengthen their belonging to the State of Israel and to the Jewish people's view of the land owner of the Land of Israel." "We saw the huge differences between the demonstration in which Israeli flags were carried even more than the Druze flag and the anthem was sung, including the words 'the Jewish soul sings', the hymn we sing in all ceremonies and with regard to Jewish identity. This flag represents us and the symbols and the anthem represent us. We do not deny any of the symbols of the State of Israel. Safdie sharpens and clarifies that the anger that led to the protest last week "came from a feeling that the law took the Druze out of their natural place, and because they ignored the Druze, they felt that they were out of their natural circle,"
"The Druze are standing by the strong side, but that's not true, the Druze are standing by justice, not the strong side, that was the case even before the state became strong." Safdie also addressed claims made on the right that the New Israel Fund is behind the protests against the Nationality Law. "For all those who claim that the Left and the New Israel Fund made a round about us, then if the fund actually financed the demonstration, they say that they are Israelis and want to prevent the schism."